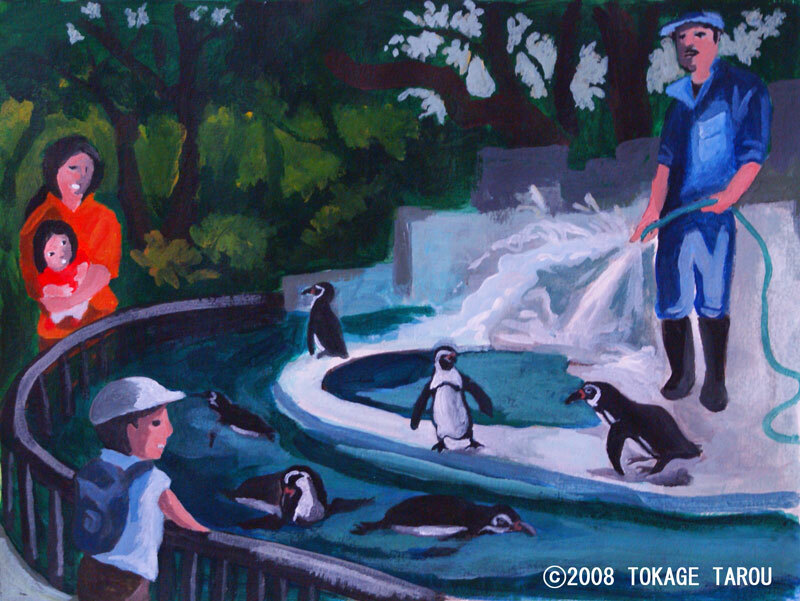 Special Report Jack visited Tennoji Zoo on July 15th, 2008. Zookeepers told Jack a lot of intresting stories about animals. 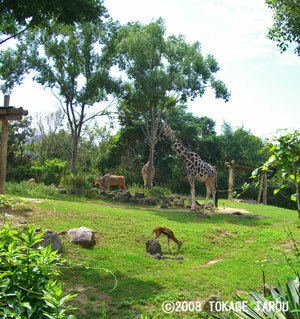 Many More Animals at Tama Zoo!! 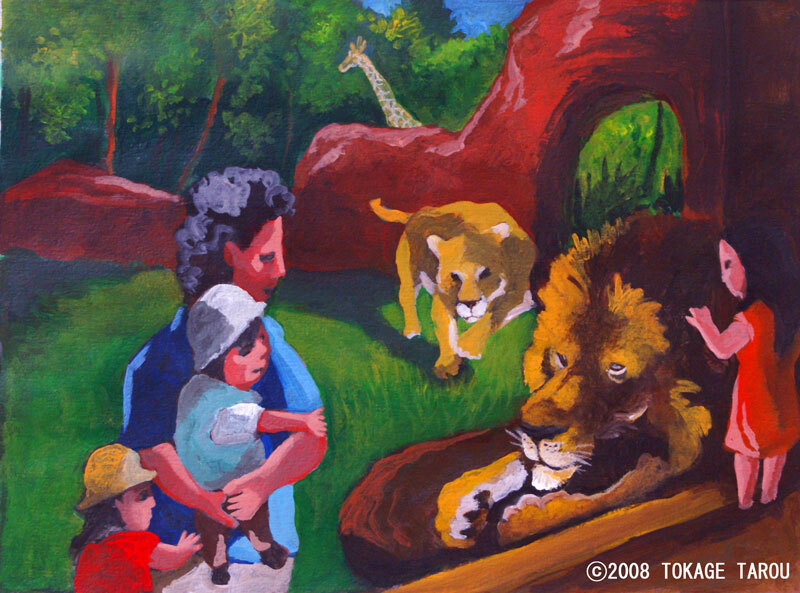 Tennoji Zoo has been changed. 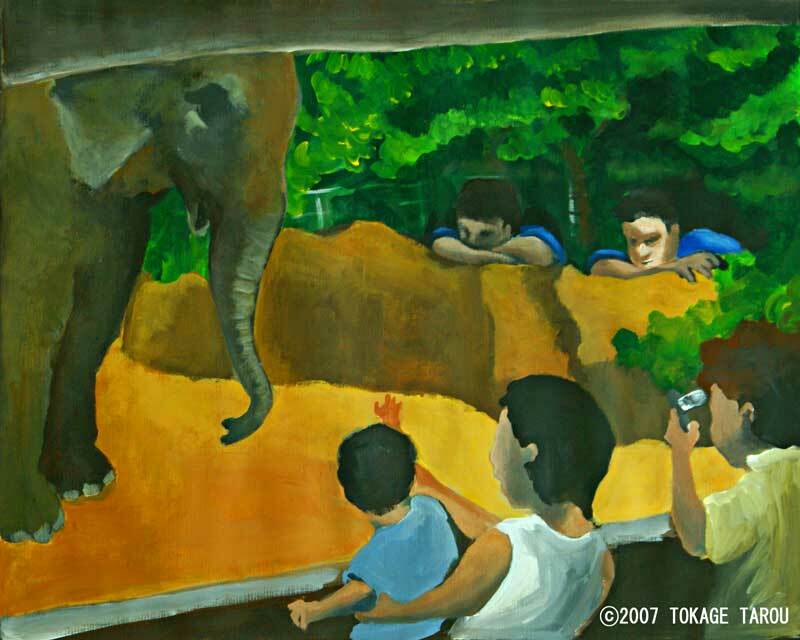 Since the original blue print was drawn in 1995, the natural habitats of the animals had been re-created in the zoo. The animals are displayed as if they are in the wilderness. The featured site is African Savannah Zone where you see several different kinds of animals living together. The residences of the vast site are giraffes, zebras, The Thomson’s Gazelles, ostriches, and more. You see the giraffes use their tongues to grab leaves on top of the Locust trees while the Thomson’s Gazelles picking weeds on the ground. It looks peaceful, but it actually took a lot of time and zookeepers’ effort to re-create the environment like this. The giraffes had very hard time to get used to the new environment. Their feet are sensitive and do not get used to accept the new feeling on the ground easily. One of them needed 2 years to step on the natural soil ground without hesitation because they had been on the concrete floor for long before. Another issue was the fact that it was delicate matter for several different kinds of animals to share the same space. 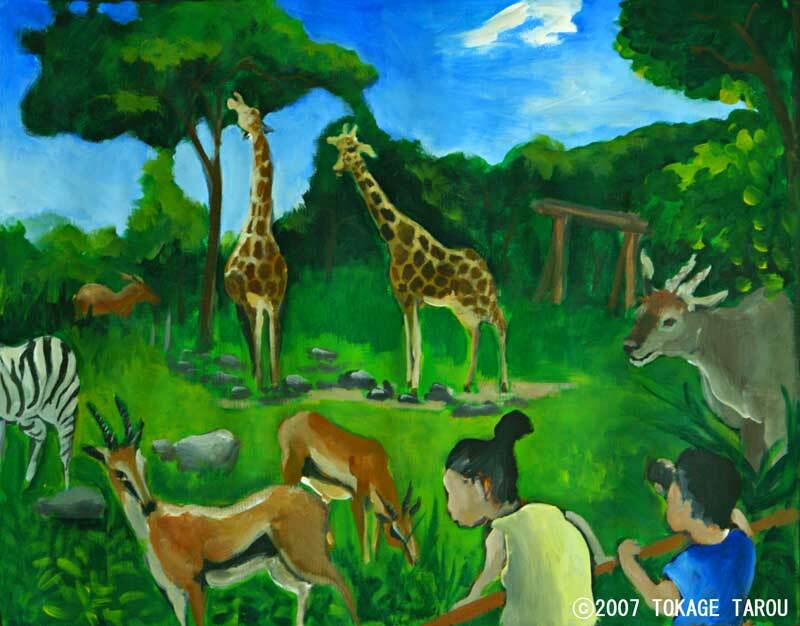 In stead of releasing the animals all together into the vast space, just a few kinds of animals were released to meet each other, such as giraffe and zebra, zebra and eland. 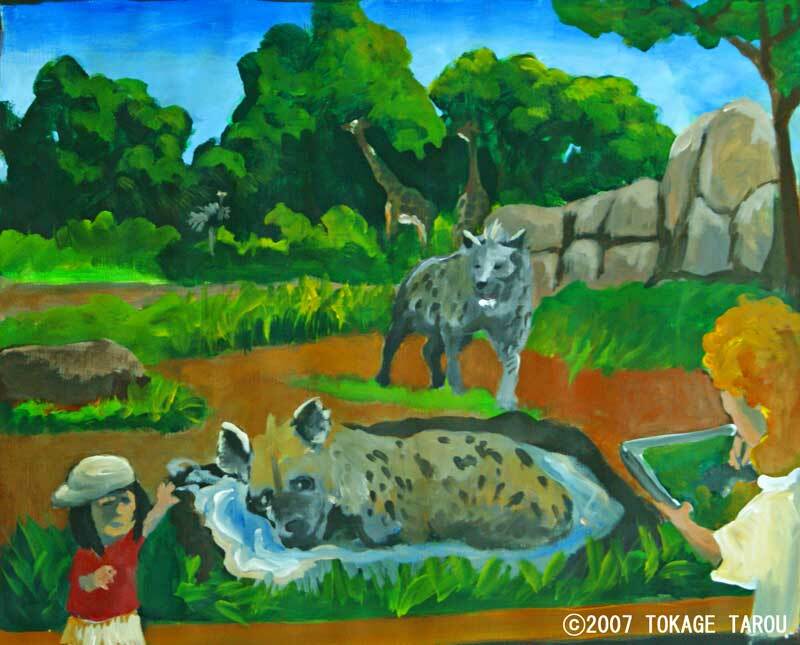 It may be common to encounter another species in the wild, but here the African Savannah Zone is not as big as real wilderness, and animals had already adapted the zoo life in the small space surrounded by iron cage. Through this training the animals gradually got used to share the spaces and now you see them all together. But they are still delicate to each other in the new site. Territorial zebras sometimes run after the Thomson’s Gazelles. So separated spaces was made only for the Thomson’s Gazelles. All animals are monitored and the zookeepers bring more idea to give the better environment to the animals. It is a replica, but looks so real. 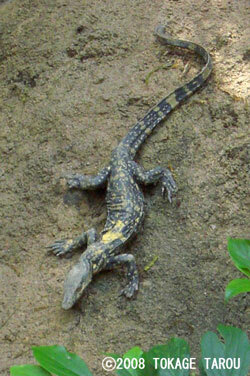 He is the second lizard. The first one left his leg behind and ran away. There are more real looking animal replicas in the zoo. Don’t get tricked!! The habitat is the savannah mainly in Sudan, Somalia and Nigeria in Africa. The height is 4 to 5 meters. The new born calf is two meter high. It grows 3 cm everyday and become double size in a year. The tongue is 40 cm long and good at grabbing acacia leaves on top of the tree. The kicking power of the back leg is strong enough to knock down lion to death. Normal life span is 25 to 30 years. Keepers talk is scheduled at the feeding time. The zookeeper Aburaya said Harumi was 24 years old. According to him, the hairs underneath of chin are very sensitive and work like antenna. The big eyes help giraffe have a good view to watch for predators far away. Do you want to know more? Let’s ask him! Call his name. Here he comes. Tommy the Rhino likes oak leaves. He came closer when the veterinarian Takeda called him. “I guess that he thinks it’s snack time. It seems that he does not afraid of me because I have never given him a shot”, said Takada. When Tommy needs any medial care, Takeda hides medicine in Tommy’s banana or sweet potato. Rhino normally shows protective behavior to strangers, so it is very important to build a good relationship between the rhinos and their zookeepers and vets. Tommy and his wife Satchan have a son Sammy. Sammy is now in Chester Zoo in London for bleeding. The family trees of endangered species in captivity are managed by an organization. The organization is coordinated with others in foreign countries to help an animal to find a mate. Sammy the Black Rhinoceros found his mate through this way. Sammy mated successfully. Yes! Tommy and Satchan are expecting their grand child in UK. The population was 65,000 in Africa in 1970s, but only about 2,500 in 1993. Now the wild Black Rhinoceros range in South Africa, Namibia, Zimbabwe and Kenya. Conservation Programs have helped its population gradually increased since 1996. Another kind of Rhino, the White Rhinoceros has the population of 15,000 while the Northern White Rhinoceros is critically endangered. 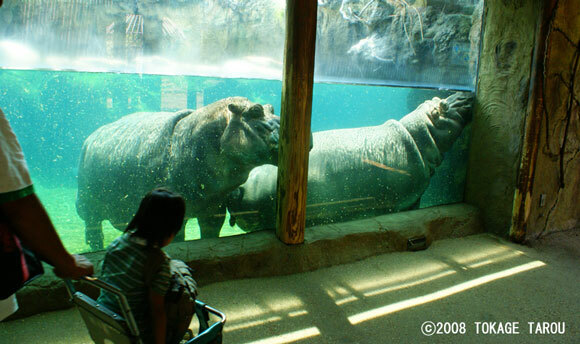 This is the very first facility in Japan that the visitors can observe Hippos in water. 450 tons of water in the tank is filtered 38 times a day. You can see the Tilapias poking Hippo's body to eat tiny bugs on his skin. 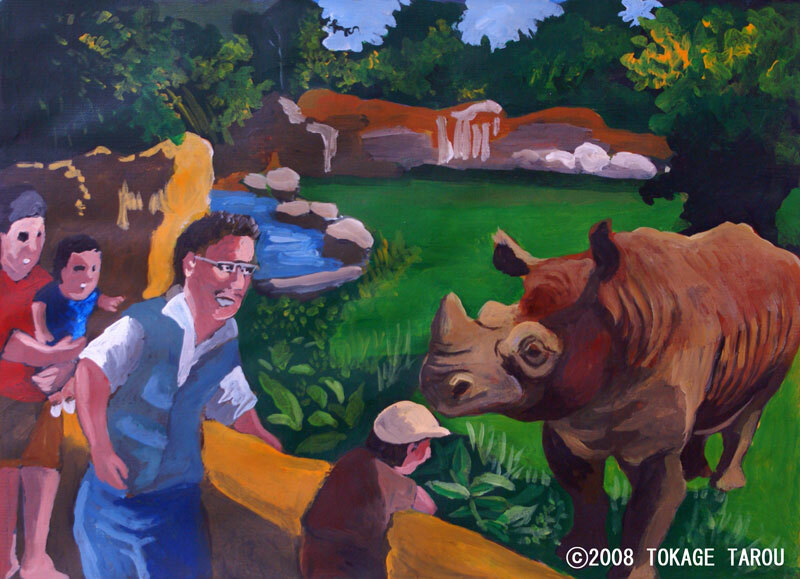 Tennoji Zoo has three hippopotamuses, the female Natsuko, her son Tetsuo, and Tetsuo's fiancé Teana. These are Natsuko and Teana (above). They young couple Teana and Tetsuo will live together in near future. The rock is heated in winter. Cool air comes out from the vents here on hot summer days. Needless to say, it is Leo's favourite place to lie down. One day, soon after the lion family moved to this new habitat, Leo jumped towards a little kid outside the acrylic shield. The old habitat was surrounded by iron grill, and the new one has acrylic shield instead between the lions and the zoo visitors. He might forget that there was the border between him and people and try to protect his territory from strangers. Or he might think that he found his prey. He still has savage heart. You see the lions just sleeping all the time? Lion sleeps for 20 hours a day. Let's go see the Elephants! 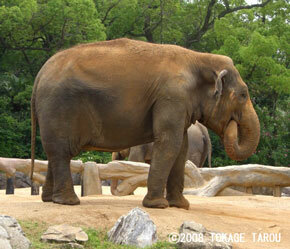 There are two female elephants in the Asian Rain Forest Zone. The one is Haruko, 60 years old. The other is Runny Hiroko, who was sent from India for Osaka Expo in 1970 and now 39 years old. Her name Hiroko means Expo, and Runny means princess in Hindu. Haruko is an old lady and almost all of her original teeth have been lost. She needs some assistance from her zookeepers to play in water that she loves. Elephant creates hierarchical society with a female eldest on the top of it in the wild. Here, Haruko is the boss, but Runny Hiroko challenges. Sometimes Runny Hiroko throws her excrement to Haruko and she fights back!! By the way, elephant drops about 50 to 60 kilograms every day. So Haruko and Runny Hiroko produce 120 kilograms! It is composted to be nutritious soil and delivered to Osaka citizen. Nishida has been the elephants' zookeeper for more than 10 years working here with another zookeeper Nishimura. They train elephants to be able to check the elephants' health. It is very important to keep the elephants' soles clean. 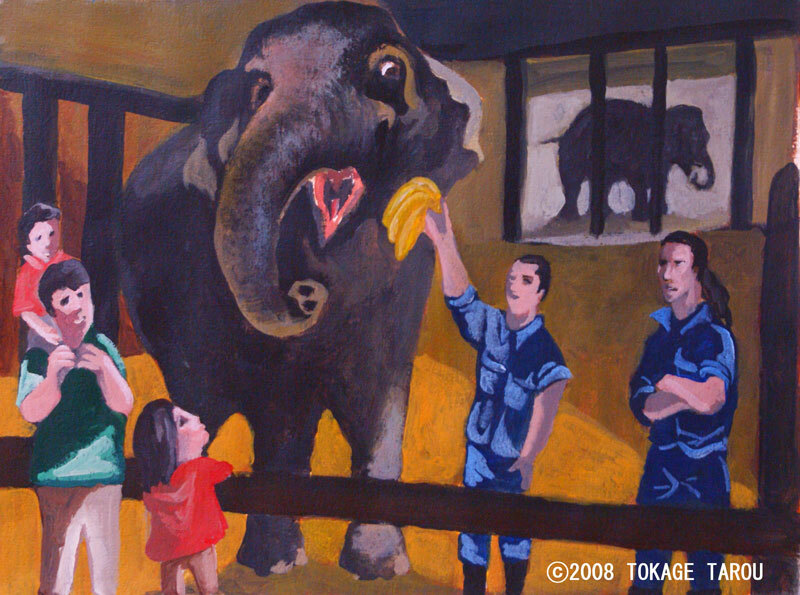 Nishida and Nishimura get the two elephants to move in certain way, and treat them with apples. Elephants were trained to work for people such as carrying logs and lumbers 3000 years ago in Indus Valley civilization. Nowadays, many elephants work for humans in Thailand, Myanmar, and other countries. Wild elephants range in Bangladesh, India, Thailand, Indonesia, and so on. The population decreases while the wild forests are cut down for the palm tree plantation. Male elephant has big trunks and female has very little ones. Some do not have trunks. 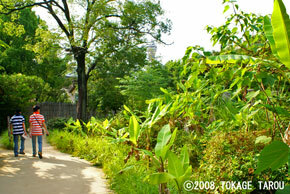 Japanese Fiber Banana trees are planted in the Asian Rain Forest Zone in Tennoji Zoo to remind people that banana plantation reduces the wild forest, which is the habitat of elephant. Two koala bears came from Melbourne Zoo in June in 2008. The male is Bark, and the female is Anber. Their zookeeper Chandi de Alwis came to help the two koala bears get used to the new zoo environment in Tennoji Zoo. The two koalas were kept in the environment of 15 to 25 degrees Celsius during the long travel. They experienced big environment change from Melbourne to Osaka, but the zookeeper Chandi sees the two koalas has been getting used to the Osaka weather. Chandi was going to stay with them for 2 weeks, which were extended to 25 days to make sure the two koalas were fine in the new zoo in Osaka. "I am an expert of platypus, but koala bear is the symbolic and important animal of Australia as well as platypus. It will be hard for me to leave the two koalas, coworkers of Tennoji Zoo, and the city of Osaka", said he. The habitat is east side of Australia under the altitude of 1000 meters. The main diet is eucalyptus leaf which has poisonous substance and is slow to be digested. So the koala bear needs 22 hours of sleeping each day to take the nutrition from the leaf and not to spare energy efficiently. More than 1700 kinds of plants are threatened to extinct by global warming and climate change in Australia. Eucalyptus is not the exception. The effect to the Koala bears is inevitable. 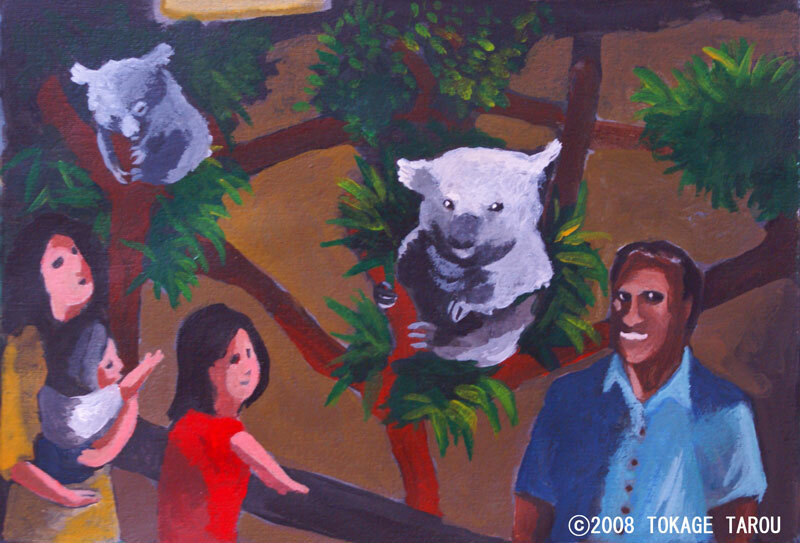 I was overwhelmed by the steamy hot summer air after I left the air conditioned Koala pavilion. It is too warm to walk around on the sunny day in July. But the penguins helped me to forget the hot weather. They swim in the water as if they are flying the sky. The Humboldt Penguin habits on the coast line of Chile and Peru, so they are flexible to blend in the warm and cold weather. A lot of unique ideas have become realities in the zoo from planting to designing architecturs to recreate the natural habitat of Asian and African animals. 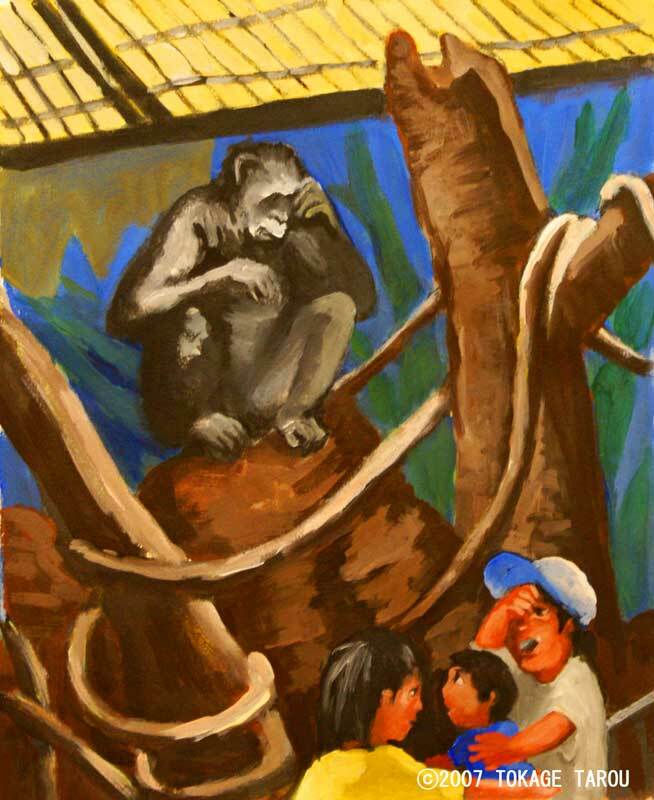 Most of the ideas came from the zookeepers and veterinarians, who spent long time with animals in the zoo. 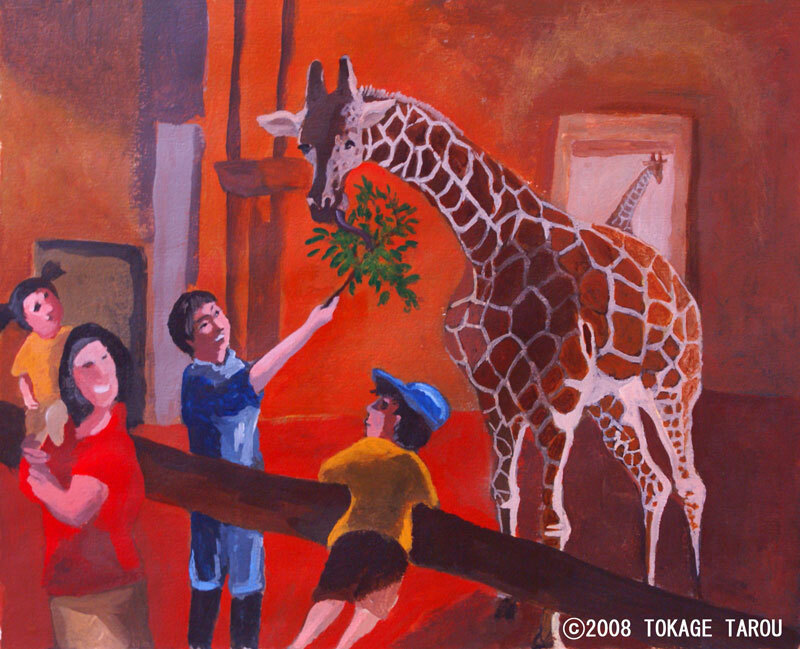 "Tennoji Zoo keeps developing more", said Takeda. 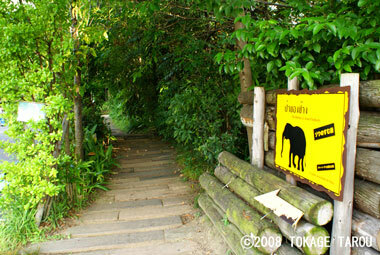 The Tennoji Zoo is the third oldest Zoo in Japan. The biggest enclosure at the centre creates an environment just like the African Savannah where various species are living together. He looks like "The Thinker" on top of the Gates of Hell by Auguste Rodin. He may just be tired of the very hot weather. To me, he looks like he is thinking deeply about something serious or is worried about some big problem. Well, who knows? Only he knows. Would it be possible for his chimp friends to know? The Elephants love their zookeeper. The animals react the movement of their zookeepers. This Elephant came closer to us because his zookeeper was nearby. "Have your camera ready!!" Big savannah in the big city of Osaka. This Savannah yard looks so real. Giraffes and Zebras live together where Hyenas and Lions can be seen . It is just like a view of Africa that you might see on TV. Of course there is the security divider between the Herbivores and the Carnivores. It was a very hot day. A Hyena was in the pond. I looked at her for a while and then left. Suddenly she started to splash the water. "That's interesting!" I went back to look at her again. She stopped splashing again. So I left and she started to splash water again. I came back and she stopped. Is she teasing me?